The Airstrike is a great weapon for attacking quite large areas of landscape. It also provides a method for a sure-fire kill if the enemy is out in the open when sudden death begins. 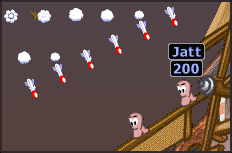 Each missile can achieve a maximum of 30 points of damage. If you can, try and hold onto this one until sudden death begins as it provides an excellent weapon to fall back on when the armoury is at an all-time low!